Amir H. Fallah. “A Hunger For Which You Can't Have” (2017). Acrylic on Canvas. 68 x 82 INCHES. Courtesy of the Artist and Shulamit Nazarian, Los Angeles. Amir H. Fallah. “Enrapt” (2017). Acrylic on panel. 24 INCHES IN DIAMETER. Courtesy of the Artist and Shulamit Nazarian, Los Angeles. Amir H. Fallah. “Embracing the World” (2017). Stain Glass, Fused Glass, custom LED light panel, walnut frame. 32 1/6 x 42 INCHES. Collaboration with Judson Studios. Photo by: Judson Studios / Kyle Mickelson. Amir H. Fallah. “Genealogy” (2017). Acrylic on canvas. 6 x 4 FEET. Courtesy of the Artist and Shulamit Nazarian, Los Angeles. Amir H. Fallah. “Split Between Faraway Lands” (2017). Acrylic on canvas. 4 x 4 FEET. Courtesy of the Artist and Shulamit Nazarian, Los Angeles. Amir H. Fallah. “Veneer” (2017). Acrylic on canvas. 30 x 40 INCHES. Courtesy of the Artist and Shulamit Nazarian, Los Angeles. Amir H Fallah. "Young Pioneers" (2017). Acrylic on Canvas. 5x 4 FEET. Courtesy the artist and Shulamit Nazarian, Los Angeles. When it comes to coming to America, we are all strangers here. Maybe our parents or grandparents were immigrants, and we’ve had a chance to talk to them about that. Maybe it was even earlier, and the story has passed into the stuff of legend. Maybe it was us. Maybe we are the immigrants ourselves. There’s a wide gap, wider than just time, between first generation and second or third—but however we arrived, it’s our home now, and we really need to figure some stuff out. Art is uniquely suited to tackle some of these difficult ideas about who belongs where, and how to both embrace your identity, and not be defined by it. 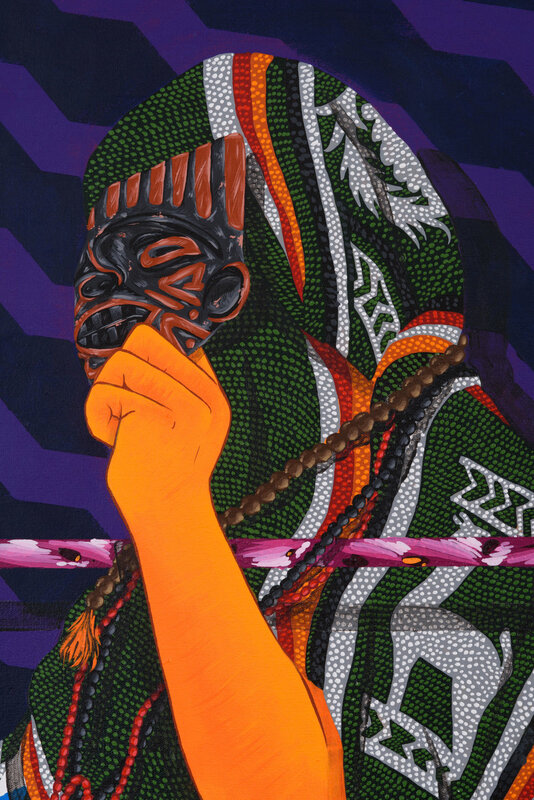 Amir H. Fallah’s art is the perfect place to start. The Los Angeles-based artist, who immigrated from Iran at the age of five, has long sought to revitalize art historical conventions of portraiture and still life. His recurring motifs–including figures draped in fabric, symbolic personal belongings, and lush tangles of flowering vines–have a kind of baroque exoticism. Fallah wryly notes that because his name is Amir, people assume the cloth-covered heads are about Islam—but they never really were. It was more optical and conceptual than political. But now, in the world we are suddenly somehow living in—a world of travel bans, anti-immigration sentiment, and race-based identity politics-—Fallah is giving audiences, and himself, more permission to see it that way. Fallah’s art has an intensely chromatic, uncanny valley kind of realism, depicting a riot of patterns and botanical species that do not share common tropics. It’s a kind of peaceable kingdom of the plant world, itself representing the cross-continental hybrid allegory of human migration. The figures, which are not clearly gendered, are partially or completely covered by heavy folds of printed cloth, rendering them against the fecund backdrops both highly visible and also totally unseen. Like the flora, the profusion of pattern and gradient should be clashing, dissonant—paisley, stripes, florals, polka dots, rug designs, silks, shrouds, t-shirts every color of nature and invention—but the artist proves that it works. Fallah is considering alternative methods to accomplish what a portrait is supposed to—namely, to reveal the character and inner life of the subject—without the central operations, like rendering their face. His particular relationship with still life fits into this model too, as Fallah assembles and deliberately arranges individualized assortments of objects within the picture. Through studying these artifacts the subject’s ancestry and family history are revealed, via the personal treasures and heirlooms they have kept—aging photographs and keepsake albums; jewelry, dolls, toys, candlesticks, religious books, etc. Amir H. Fallah. “Young Pioneers” (2017). Acrylic on canvas. 5 x 4 FEET. Courtesy of the Artist and Shulamit Nazarian, Los Angeles. As the founder and publisher of art world cult favorite Beautiful/Decay magazine, Fallah has always celebrated the deep currents of narrative, figurative, and allegorical painting, and has long advocated for fine art that explores the human condition. But in certain recurring motifs, such as the framework of colored bars that sometimes interrupt the picture plane, one sees his love of art history and theory; these impolite lines represent the canvas stretcher bars that would be visible on the verso, suggesting both transparency and artifice amid an essay on truth. A roundup of recent exhibitions includes celebrated events in Tel Aviv, Dubai, Tehran, San Diego, Portland, Venice, Nuremberg, Hong Kong, and Overland, Kansas. He is a 2017 recipient of the prestigious California Community Foundation Fellowship for Visual Artists. By rights, he should be feeling appreciated both here and abroad. And yet, his September exhibition at Los Angeles’ Shulamit Nazarian Gallery is titled A Stranger in Your Home—because somehow, after all the progress, learning, empathy, freedom, and globalization, he finds himself living in the nation of his birth: a beacon of freedom to his parents; currently a place where his Persian grandmother is not allowed to come for a visit, and where the frequency of random searches of his dark-skinned, bearded, Iranian-sounding person has markedly increased. And so finally, in 2017, Fallah is making new work in his signature style that has taken on a vast new dimension in the consciousness of both the artist and the viewer. And what about the show’s title? Who is a stranger in whose home, exactly? Is that how Americans feel toward new immigrants—accusatory? Is that how immigrants feel about themselves—alone? Is that the artist himself, wondering why the world is suddenly now trying so hard to make him feel like the Other? In these paintings the space is frequently literally divided in half, each defined by the colors and objects from vastly different places. Figures stand or recline, stretching their bodies, feet in one half and head in the other. What’s so refreshing about Fallah’s approach to the thorny topic of contested identity is that although he feels personal and civic frustration intensely in the political sphere, his work itself is not polemical or piqued. If anything, the extremely gorgeous, optically seductive architecture of pattern and color is so attractive it’s almost like beauty has been weaponized. It posits print and pattern as a stand-in for personality, it enlivens the scene with depth and emotion. Making no argument other than one for attention and empathy through the agency of classical humanism, he uses optical devices to flatten, constrict, and expand space in ways that symbolize the psychological machinations of an immigrant as they seek to find, and become a part of, their new country. A Stranger in Your Home will feature not only a large number of paintings made in this way, but also an immersive sculptural work with a unique audio component. The paintings are portraits, by drape, vine, and heirloom, of people who are immigrants or first generation residents; the belongings displayed are their own. There’s a self-portrait too, which Fallah had rendered in stained glass, and which is very much about his own young son. The stained glass, a collaboration with Judson Studios is viewable only upon entering a small apartment in the center of the gallery, a box-like chapel in which those who come inside will find not only the luminous image, but also a soundtrack made of spliced interviews with the portraits’ subjects, describing their experiences. And a quick note about skin tone—it is basically unidentifiable, a kind of gold that seems non-white or not-only white. 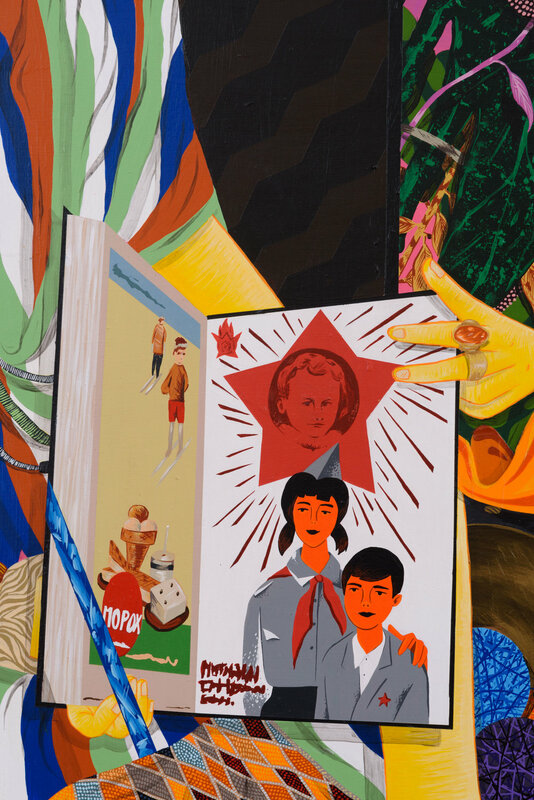 It is definitely a fantasy race, and indeed, though his personal touchstone is the Iranian diaspora, he paints and interviews Mexican and Korean immigrants for this project as well. Of special note, however, is the central core of the interviews, those the artist conducted with his parents. He interviewed them separately and cut their accounts together, merging their somewhat different versions of the story into a metanarrative that, along with the rest, is really about the nature and the shape of a family, and love that remains true and eternal even when its shape shifts to fit the times.